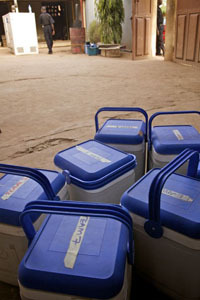 MSF staff manage supplies for a meningitis campaign in, Nigeria, in April. As Doctors Without Borders/Médecins Sans Frontières (MSF) starts to provide support to vaccination campaigns against Africa’s deadliest form of meningitis in Mali and Niger, it is doing so with a new vaccine in hand that is far superior to those that have existed so far. It provides protection from the infection for up to ten years, and can be administered to babies, making possible the broad levels of vaccination that can prevent epidemics. In many ways, the new vaccine allows us to get ahead of the epidemiological curve. 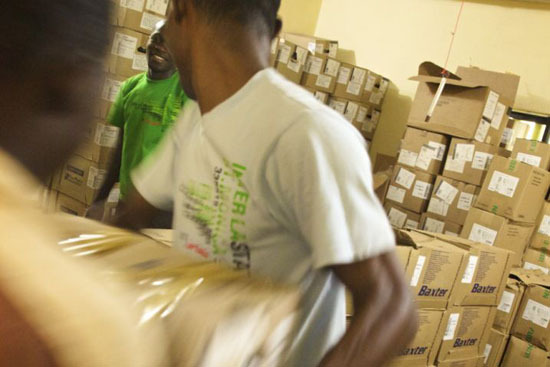 But beyond its potential to change the course of meningitis in Africa, the new vaccine stands out as an example of how a product can be developed with the needs of people in developing countries in mind, and at an affordable price—just US$0.40 per person. 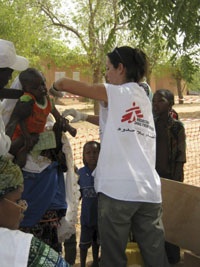 MSF medical staff administers meningitis vaccine during the first day of a mass vaccination campaign. The Meningitis Vaccine Project was launched in 2001 by the organization PATH and the World Health Organization with the main goal of creating an affordable vaccine that would respond to a specific meningitis strain that plagues Africa each year. Needed technology was licensed from the US Food and Drug Administration to the Serum Institute of India, which agreed to develop the vaccine and sell it at an agreed-upon low price. The total cost to develop this vaccine was roughly US $60 million, compared to $150 to $350 million for vaccines that have been developed through the typical ‘blockbuster’ research and development model pursued by multinational pharmaceutical companies. In the latter, the companies charge whatever price they think is fair, with different prices in different countries. This new system, whereby product development is subsidized in exchange for charging affordable prices, should be used to develop other vaccines. Vaccine doses are kept cold in Sokoto. Roughly 25 countries in Africa are vulnerable to meningitis outbreaks each year. So, there needs to be a plan to get the vaccine to people in countries beyond the first three where large-scale vaccination campaigns are scheduled. The priority countries to implement the vaccine next should be determined. And once vaccination campaigns have been concluded in affected countries, the vaccine should be included in routine vaccination programs to ensure the entire population is protected in the long term. But so far, there are no concrete plans as to how the vaccination will continue beyond Mali, Niger, and Burkina Faso. And there are gaping holes in the funding available. Although GAVI, the agency that funds vaccination activities in developing countries, has indicated that their support for meningitis A roll-out will be ‘significant’ until 2020, no overall commitments have been communicated to countries. PATH estimates that the full cost of initial campaigns, where a substantial proportion of a country’s population between the ages of one and 29 needs to be vaccinated, will cost less than $1.50 per person, including all human and logistical resources. Thereafter, the costs are expected to diminish, as only children reaching one year of age would need to be immunized.